These bars are the perfect way to boost your protein intake from plant-based sources. Packed with oats, fruit, and seeds, they’re naturally high in fibre — making them an ideal healthy snacking alternative for a balanced diet. With 9.9g of protein from a blend of hemp and pea proteins, these bars will help to grow and maintain important muscle1 — getting you closer to fitness goals, whether that’s to lose weight or bulk-up. 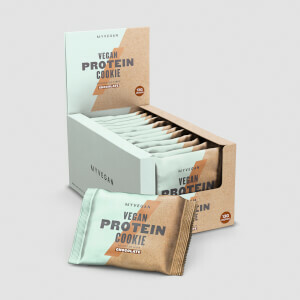 They’re a tasty way to stay on track with daily protein requirements, which can be difficult on a plant-based diet — plus, they provide 7g of fibre and a unique fatty acid profile from the addition of coconut oil. When to enjoy Hemp Protein Bar? These treats are perfect for on the move — enjoy them at home, in the gym, or at the office. What to enjoy Hemp Protein Bar with? To further fuel your plant-based gains, try with a shake of our Vegan Protein Blend. It’s packed with 16g of protein and is just 90 calories per serving. Oats (19%), Coconut Oil, Hemp Protein Powder (13%), Fructo-oligosaccharide, Golden Syrup, Pea Protein (10%), Date Syrup, Hemp Shelled (3%), Dried Dates (3%) (Dried Dates, Sugar, Rice Flour, Sunflower Seeds (2%), Pumpkin Seeds (1%), Chia (Salvia hispanica) Seeds (1%), Linseed (1%), Cinnamon. Impressive start to vegan bars! I was sceptical when I was buying them but price meant they were worth trying and even if they weren't very nice I would still make sure they got eaten. These are really nice. They are soft which was a really welcome surprise. When I first saw them I assumed they were going to be like chewing a doormat but they are the absolute opposite. They are ready to crumble in your mouth and they have that lovely mix of soft and firm bits (perhaps eat them while sat down though!) The firm bits come mostly in the form of pumpkin seeds which are also a nice addition. Something which may put some people off is the slight 'powdery-ness' but that was fine by me. They have a subtle cinnamon flavour which helps the whole experience. 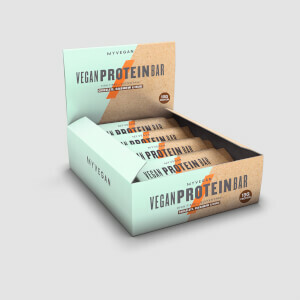 These will definitely help me in my quest to go from vegetarian to vegan and for the price they will be a frequent in my basket on myprotein. If they suit your dietary needs then I would say have a try. I'm not vegan These bars are very tasty. They are not gloopy and heavy like a lot of protein bars. I cant imagine how anyone could think they taste bad. On the other hand I am not a sugar fiend and wouldn't dream of drinking a can ok coke, nor do I have the sweet tooth of a 12 year old. I'm sure some people love this but in my opinion it tastes of mud.... mixed with pond water.... with sand in it. This can be marginally improved upon if you mix it with something with a very strong flavour. 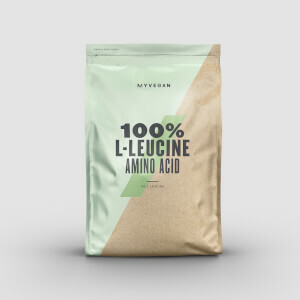 Saying that, due to its rather 'natural' taste, it makes you really feel like it's good for you, you can literally taste all the extra amino acids, and omega 6 and 3. That's the negatives out of the way. Nutrition wise, I think this is far better that whey protein, lots more goodies in your shake, and it's a good alternative if you're finding whey protein really bloats you out and you like drinking dirt. I shall not purchase this again though, I may try the soy protein...or just eat more steak. My daughter and I love hemp bars. We each have one a day and were very worried when they weren't available in boxes on the website. They have a unique taste, very dry which may not suit everyone's likes. We are now firm followers of this form of protein and have just ordered 6 more boxes!!! Coffee or water after training. Plant based protein does not necessarily taste great. These I found similar to plant protein I've used before and mixed with a load of nuts and oats. I liked the taste and loved the texture. Without being over sweeten and ruining them in my book they taste fairly natural, slightly earthy and organic. Having bought a box and to try and will now buy a few more boxes. I'm not vegan or even a veggie but I like to introduce plant based products into my diet. Sensible eating plans and a healthy lifestyle. It’s been amusing reading some of the reviews from people who aren’t vegan but have tried this product because they fancy trying something, and hate the taste & texture. Vegan bars like these are not primarily manufactured for our palate, they are plant based foods for people who do not eat food derived from animals. It has a completely different taste & texture to animal protein based protein bars. If you ‘fancy a change’, then buy some Jaffa Cakes. This is a vegan product & it tastes like a vegan product. It is suitable for my lifestyle & absolutely does the trick for me, since I switched to a vegan diet. I’m grateful that ‘MyProtein' caters for all tastes & diets. These are delicious and filling - perfect for a pre-workout snack as the sugars give a boost of energy which is controlled by the added cinnamon. Strong hemp taste which was obviously to be expected when buying a hemp bar so it was a thumbs up from me! If you like the taste of hemp, seeds, fruit, then that exactly what this is. All natural. Excellent value. Filling and delicious.